Astruc, Zacharie (1833-1907). Sculptor, painter and art critic, he participated in the first Impressionist exhibition and also in the Exposition Universelle of 1900. His defense of living art was consistent and whole-hearted; he had been a defender of Courbet, and was one of the first to recognize the talent of Pissarro and Manet. 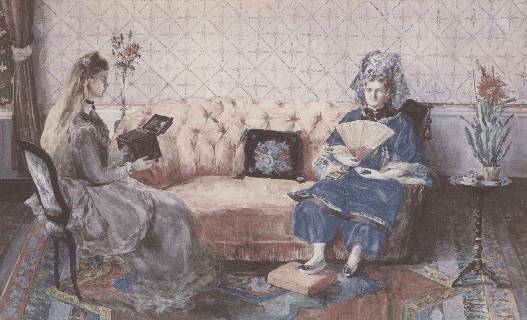 To celebrate the Salon des RefusИs, he brought out a daily paper for its duration, in which he lauded the participating artists, describing Manet as `one of the greatest artistic characters of this time'. In 1865 he hailed the genius of Monet and was responsible for introducing him to Manet. He wrote the introduction of the catalogue of the one-man exhibition that Manet arranged in a pavilion outside the Exposition Universelle of 1867. He appears seated beside Manet in Fantin-Latour's A Studio in the Batignolles Quarter (1879; MusИe d'Orsay), and was painted by Bazille (c. 1869; Collection FrИdИric Bazille, Montpellier) and by Manet (1866; Kunsthalle, Bremen). Astruc himself executed a bust of Manet and by the 1880s was receiving recognition as a sculptor, his most popular work being the Mask Pedlar (1883) in the Luxembourg Gardens.